Institutional policy states that outside funding will first replace the student’s self-help (loans and/or work study) awards where available, thus reducing the amount a student may need to borrow or work. Following the reduction of self-help aid, we will also allow outside funding to help cover your minimum student income contribution. If the total of your outside funding exceeds your self-help awards and student contribution, we may be required to reduce other forms of aid including Scripps College Grants and Scholarships. Transportation cost estimates vary by student based on the geographic location of their permanent residence. Scripps requires all students to have health insurance, either through their parents or another plan. If the student is not covered by a parental plan, the student may request that the Scripps Grant be increased to cover the cost of a Scripps Student Health Insurance Plan premium. Maintain a minimum cumulative 6.0 GPA (on a 12.0 scale). Successfully 67% of the courses attempted cumulatively at time of assessment. 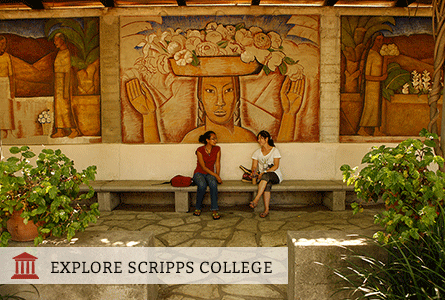 Scripps Aid is generally limited to 4-years in which to complete one degree. On an appeal basis, federal student aid can be made available for up to 150% of that timeframe or 6-years. Must remain enrolled full-time each semester. A minimum student contribution of $1,700 is expected from summer employment or savings. Students are generally expected to cover their transportation and personal expenses from summer/academic year employment and/or savings. The personal expense allowance includes the average Federal Direct Loan origination fee experienced by borrowers in the 2017-2018 academic year. At Scripps, 58% of students receive need-based grant or scholarship aid. Both need-based and academic scholarships are awarded. Use Scripps' MyIntuition Quick College Cost Calculator or Net Price Calculator to estimate how much financial aid you may be eligible to receive.